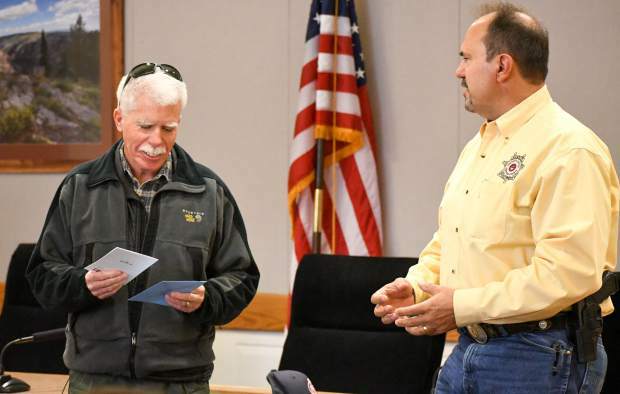 Garfield County Sheriff Lou Vallario, right, presents Sgt. Jim Sears with a $460 giftcard to Summit Canyon Mountaineering during his retirement party in Glenwood Springs on Wednesday. A 22-year veteran of the Garfield County Sheriff’s Office is retiring after a long law enforcement career that’s taken him across the country and across the world. Sgt. Jim Sears is known locally as a former Garfield County undersheriff and then more recently as the sheriff’s emergency operations coordinator. Before he came to the Garfield County, Sears held a number law enforcement jobs, including as a federal agent for a couple of agencies. Sears served in the U.S. Army working in intelligence, and when he got out he went back to his hometown of Greeley to work for the Greeley Police Department. Sears grew up and went to high school in Greeley, and attended college at the University of Northern Colorado. After about six years he went to work for the state liquor enforcement division. His law enforcement career would then take him to the Naval Investigative Service (now known as the Naval Criminal Investigative Service) in California, and as a special agent for the Federal Bureau of Investigation. With the naval investigations he worked on contract fraud investigations and helped topple a major construction fraud scheme. When he got transferred to Lake Tahoe, while working as a special agent for the FBI, he helped investigate the Jaycee Lee Duguard case. This was a famous case of an 11-year-old girl who was kidnapped from South Lake Tahoe in 1991, then shockingly found, after everyone believed her to be long dead, in 2009, in her 20s with two children. 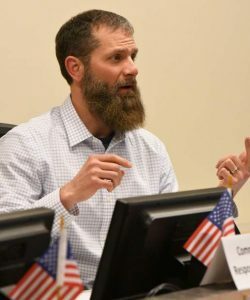 Sears started work as the undersheriff in Garfield County for former Sheriff Tom Dalessandri in 1995 after his wife, who worked for the U.S. Forest Service, was assigned to Glenwood Springs. When the current Sheriff Lou Vallario ran for office, he had another undersheriff picked out. But, Vallario wanted to keep Sears on board to take advantage of his talents, so he created a new position, the emergency operations commander, specifically for Sears. 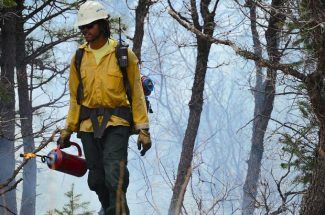 In that capacity, Sears specialized in coordinating search and rescue missions and wild land fire management. “That was one of the most rewarding periods of time I had, because the focus was on helping people,” said Sears. Anytime there was a search and rescue mission, Sears would be on the job directing the efforts and coordinating resources, working to get more support to the area. Many times those calls would come in at 3 a.m., and Sears would be ready to respond. At a retirement ceremony on Wednesday Sears, fighting back tears, told a crowd of his friends and colleagues that they could call on him anytime if they had an issue he could help with. “Just not at three in the morning. We’re done with that,” his wife chimed in. After five or six years, Sears travelled to Afghanistan to work as a contractor for the U.S. government to help train the Afghan border police, before returning to the sheriff’s office. He worked at different forward operating bases, some a mere 10 miles from the Pakistani border. In retirement, Sears and his wife plan to get in more outdoors time, as both are avid campers, hikers and river rafters. Sears said they like to hook up their camper trailer and head toward Moab, Utah, or somewhere warm in the winter and cool in the summer. Their travel plans are also aimed toward Alaska and Ireland.